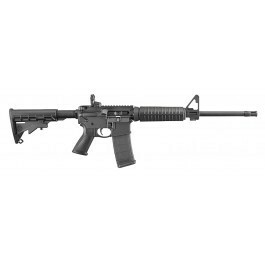 The Ruger® AR-556® semi-automatic, M4-style, direct impingement Modern Sporting Rifle offers consumers an affordable, American-made Modern Sporting Rifle with the rugged reliability they have come to expect from Ruger. Extensively tested during its development, the AR-556® is constructed from top-quality components, including forged 7075-T6 aluminum upper and lower receivers and a cold hammer-forged chrome-moly steel barrel with M4 feed ramp cuts. Chambered in 5.56 NATO, the AR-556’s carbine-length, flat-top, M4 design is fully configured with a Ruger® Rapid Deploy folding rear sight, milled F-height gas block with post front sight, forward assist, dust cover, brass deflector, telescoping six-position stock, improved trigger-reach grip, and enlarged trigger guard. Standardized M4/AR components are utilized throughout, so the AR-556® can be customized easily.